READERS! It’s time for another challenge already! I hope the time is flying for you the way it is for us; don’t forget to stretch those page-turning fingers every once in a while, and to hydrate! This is a perfect time to take a stretch break while we share the winners of our Hour 12 challenge and I tell you about our final day one challenge. If you see your name below, head over to the prize page to stake your claim! If you joined us this past July, you (hopefully) remember that we talked about 24in48 with intention, and bringing the same personal attention and intention we (as three white, cis women) apply to our personal reading lives to the ‘thon. (For a refresh, check out this post.) In keeping with that goal, we wanted to highlight a grassroots organization that is near and dear to our hearts: We Need Diverse Books. It’s hard to distill these efforts down into a challenge for our small event, but worthwhile. For the next six hours that this challenge is open, we want to see and hear about the diverse books you love, and the ways you work to diversify your bookshelves. “We recognize all diverse experiences, including (but not limited to) LGBTQIA, Native, people of color, gender diversity, people with disabilities*, and ethnic, cultural, and religious minorities. Do you have a book on your shelves that expanded your understanding of a social justice issue? Show us, and tell us how/why it did so. Do you have a specific title that opened you up to ideas, persons, struggles, settings, etc., in a new way (read our blurbs from the last ‘thon if you want an example)? We want to see/hear about it. Share a story of encountering a book by a certain author that blew your mind wide open to the importance and impact of #ownvoices representations of life experiences. We’ll share some of our favorite entries on social media to draw attention to the diverse, representative titles recommended by your fellow readers. If you’re posting a photo of your entry on social media, don’t forget to use the official hashtag #24in48 so other readers can find you, and tag us so we can see! We’ll post the winners of this challenge in six hours (Hour 24), so make sure you check back after you entered to see if you won! You’ve also got until then to enter the Intro Survey! 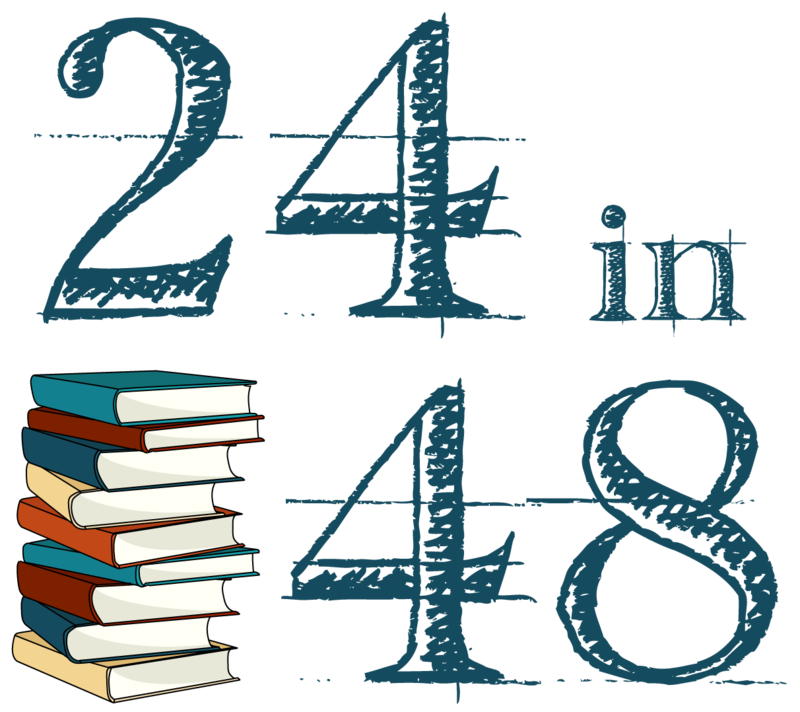 Reminder: This 24in48, we’re trying to log every book read this weekend! Track your books as you finish them here, and follow along on Goodreads!